Refrigerators account for a significant fraction of annual energy use, especially in residential buildings. While there are a few solar refrigerators available in select markets, the vast majority of refrigerators run on conventional energy. Based on the method of circulating cooling and defrosting, there are two major types of refrigerators in the market, Direct Cool and Frost Free. These refrigerators work on the principle of natural convection. They need manual defrosting periodically. The Direct Cool refrigerators are usually much less expensive than the frost free versions. These refrigerators work on a direct cooling system. There is a continuous air movement internally that hampers frost formation. A small heating element is placed inside these refrigerators which melts the ice formation. This does not interfere with the normal cooling cycle. 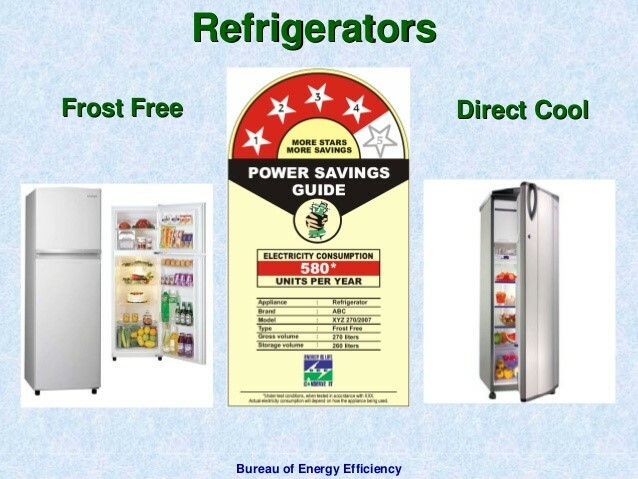 From January 2010, The BEE Star label for Frost free refrigerators has been made mandatory whereas the star label for Direct cool refrigerators is under the voluntary stage. The placement of the refrigerator should be at-least at a distance of 100 mm from the walls to ensure effective heat rejection. The refrigerator door should not be kept open for longer periods as this leads to increased electricity consumption. In the manual defrost refrigerator, defrosting should be done on a regular basis to ensure smooth running.